"There's no space", "We'll adjust", "I'll sit in the living room", "I'll wait till the guests finish dinner so that I can sit and eat". These are the things you will hear people saying when they have last moment guests for dinner. If that's the sitch, here are 10 extendable dining tables that will solve your low space issues. Solid yet light, the Butterfly table from Tonin Casa in canaletto walnut curved wood base with a black ceramic top. The sides of the top extend, like a butterfly spreading its wings, to accommodate more people. The base is inspired by the butterfly. Just like a butterfly is colourful, the top in available in varied finishes - tempered glass, porcelain, marble, and wood. Designed by Angelo Tomaiuolo. 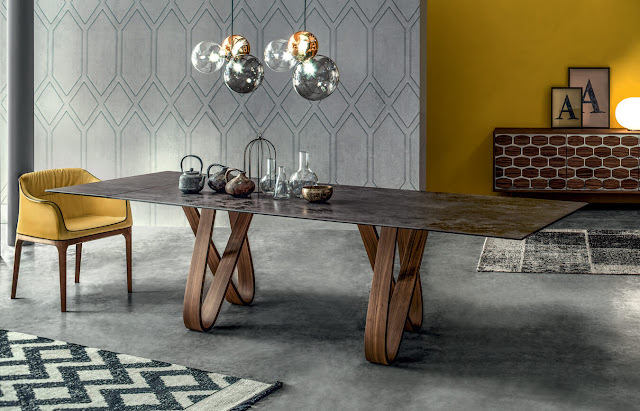 Extendable table by Tonin Casa comes with a wooden top and base in marble or wood. The combination of two valuable and refined materials gives a unique style to the table. Made in Italy, Roma is available in different dimensions and finishes. Tokyo is an eye-catching design from Tonin Casa. Two curved overlapping elements create an 'X' shaped base that is both striking and sturdy. The extensible version makes it beautiful, functional, and inviting. From the Italian brand Calligaris, Sigma extensible table can accommodate up to 8 people or more. 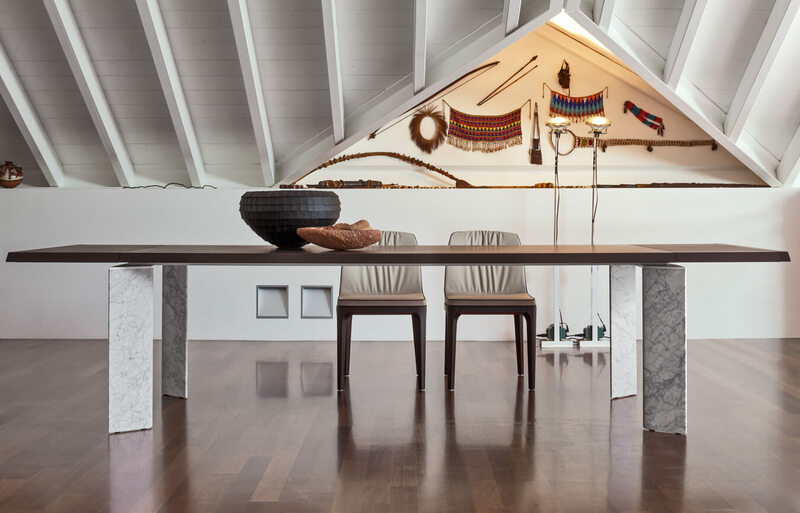 The large top is available in wood or in tempered glass which appears visibly raised off the wooden frame with the legs at the corners, giving the table its beauty. The distinctive Echo table from Calligaris can be extended on both sides, thanks to two lateral extension leaves that can be pulled individually, just pull towards you and slide them from underneath the top and align them with a simple movement. The pedestal base provides maximum comfort to all the guests and the metal base offers high stability. This functional extending table can accommodate up to 10 people. 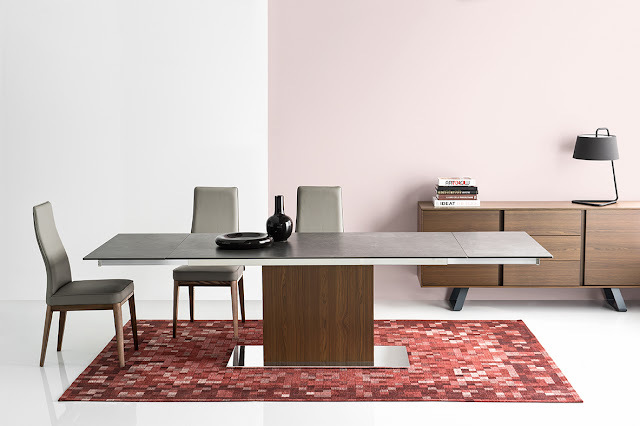 Park by Calligaris is an extra-long extendable table which features a wide ceramic rectangular top that rests on a solid wooden pedestal base or metal base with a chrome-plated metal support plate. Under the top are two side extension leaves that can be pulled out individually through a hand sliding mechanism. making it possible to comfortably accommodate up to 12 guests. Perfect for elegantly furnishing a large dining area. The Eva dining table from Alf Italia features a solitary wide column that doubles as a storage for the centre extension leaf. Made in Italy, this table accommodates up to 10 people. 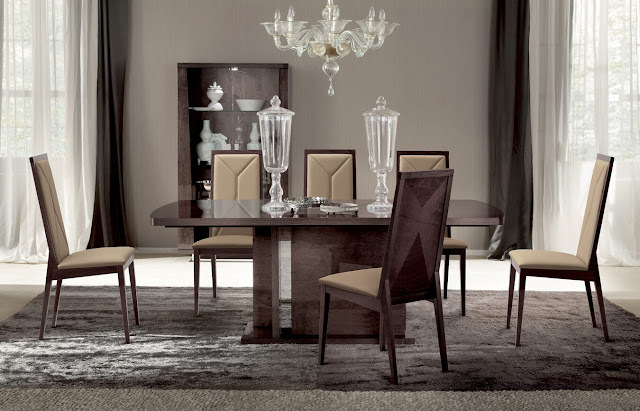 The stately Heritage extensible dining table from Alf Italia in the dark velvet finish is unique to the Heritage collection. Pairs best with matching upholstered chairs. The extendable table can easily accommodate 10 chairs. From the brand Bonaldo, the extensible Big Table is a game of balances, an optical path that leads from one element to the next, from one colour to the next. While the angular base suggests dynamism, the linearity of the top adds stability. The laser-cut steel legs are available in a range of colourful combinations. The top offers fixed and extendable versions, in an array of finishes. Designed by Alain Gilles, this table has won the Good Design Award. 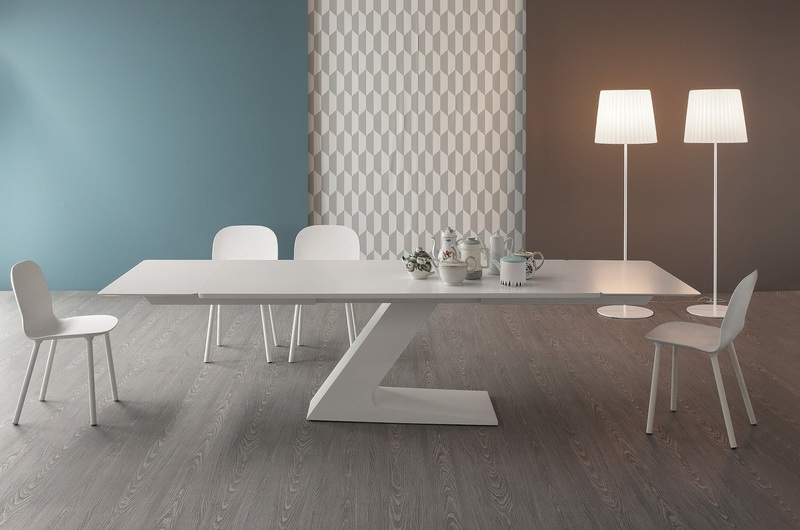 The TL table designed for Bonaldo by Giuseppe Viganò gets its name from the singular shape of the central leg, comprising two inclined elements with which the table top form the two letters T and L. The table top and base ensemble is distinguished by clean-cut shapes and extra thickness, creating a strong visual impact. The top is available in wood, glass, or ceramic. The base is available in painted metal and with copper, brass or pickled effect.